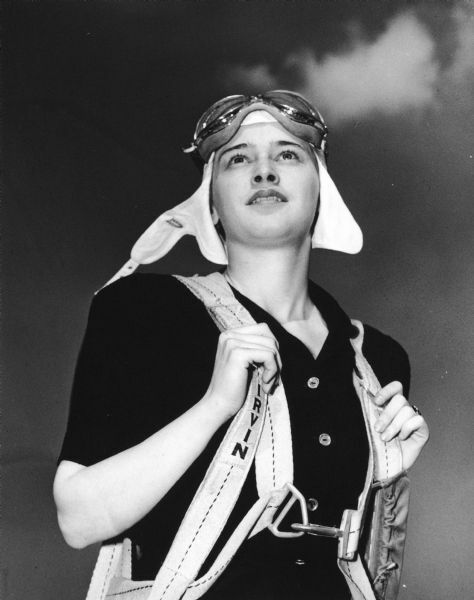 "She's Ready to Defend America," a portrait of Georgette Louise Meyer (aka Dickey Chapelle), as a member of the Women Flyers of America, an organization formed in 1940 to teach women to fly and then to ferry American bombers to Great Britain. Dickey Meyer grew up in Shorewood, Wisconsin, and she fell in love with aviation from a young age. However, given her poor eyesight, freelance photography was a better way to continue flying. In addition to covering the last months of World War II and post-war stories around the globe, in 1962 Dickey was one of the first photographers to disclose conditions in Vietnam to the American public. Dickey Chapelle was killed by a land mine near DaNang in 1965. Her papers and photographs are available for research in the Wisconsin Historical Society Archives.